Living in the moment is all about living like there’s no tomorrow. It takes practice but in the end, you’ll lead a fuller life. To do this you must realise beauty in every moment, and in everyday activities. This is your life. Now live! Take notice of the world around you. No matter what you’re doing, try to find something beautiful around you. Maybe on your way to work, you go over a beautiful bridge, or you get a view of the sunrise behind the city buildings. Realising these small things can bring life and happiness even to the most boring or routine days. Be thankful for the little things. Focus on whatever you’re doing. Even if you’re just walking, or cleaning the kitchen, or shuffling cards – how does it feel? There’s probably some kind of commentary spinning through your mind, and it probably has to do with something other than what you’re doing. Let those thoughts go and focus on what is (not what was, or what could be). In Buddhism, this is referred to as mindfulness. Pay attention to your senses – touch, sight, smell, sound, and taste. Pretend it’s the very last time you’ll ever experience whatever you’re experiencing. Have you ever been so engrossed in something that it seemed like the rest of the world just disappeared? 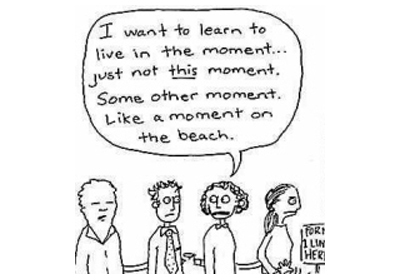 Living in the moment is about creating that state of mind at any time. Slow down, and try to savour the present. Smile when you wake up. You can set the tone of appreciation and awareness for the next 24 hours by simply waking up and smiling.Don’t wake up with a groan and a smash of your alarm clock (perhaps you need to get yourself a gentler alarm clock). There’s scientific proof that the expressions that you make with your face can actually influence how you feel. In particular, true happiness is most closely tied to a ‘Duchenne smile’ which involves smiling with your eyes, as well as your mouth. Commit random, spontaneous acts of kindness. Whether it’s donating a pound to a charity on the street, picking up litter, or helping victims of natural disasters, keep alert in every moment of your day for some way in which you can make the world a better place. Even the smallest thing, like complimenting someone, can bring joy. It’s the most spontaneous and unexpected acts of kindness that produce the greatest impact and you can’t be sensitive to those kinds of opportunities unless you’re living in the moment. Minimise activities that dull your awareness of the moment. What are you doing that tempts your mind to run away from the present? If you’re like most people, watching television or surfing the web puts you in a passive state of mind, and time slips right by. Daydreaming and getting lost in a good movie or book isn’t bad, but it’s not living in the moment because it places your concentration on something that isn’t right here, right now; it’s a form of escapism. Don’t zone out; zone in. Do things that are active, and that encourage you to look around and engage the world in that moment. Gardening, playing a game with others and playing an instrument are all activities that lend themselves to mindfulness. So get off the computer after reading this article! Be thankful for what is. When you find yourself wishing for something you don’t have, or wishing your life were different, start by being thankful for what is already in your life. This will bring you back to the present moment. Make a list of what you are thankful for right now even if all you can think of is that you are alive and can breathe. You don’t want to miss the gifts right in front of you because you are always looking beyond the present moment to what once was or what might be.